Well, technically the car was delivered yesterday with most of the battery capacity run out by the delivery drivers getting to Boulder from Denver. So, this morning marks the first official part of the test (though, as you'll see, I did get some insights from driving it yesterday as well). 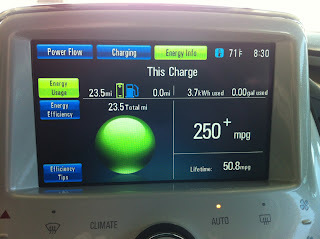 I charged fully, overnight, from 120V using the Volt's included power cord (that normally lives under the cargo area floor). It took 10 hours to go from a complete discharged battery to full. Doing so resets the stats of the center display's energy usage stats. 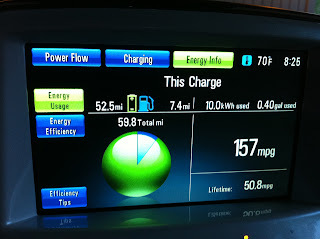 Normally this display shows the miles since last recharge divided by electric and gasoline powered miles as well as kWh used (the Volt has a 16kWh batter pack, of which 10.4kWh is usable - more on that in a bit) and gallons used. Also a measure of overall, lifetime mpg is shown (this is simply total miles divided by total gallons and ignores any sort of electricity to gasoline conversion like the EPA uses to generate their MPGe numbers. Starting out, the car showed 39 miles of projected electric range. However, given my 8 mile downhill drive at the beginning of my commute, it used regenerative braking (using the electric motors as generators to turn energy you'd burn off as heat through the brakes back into electricity) to put even more charge into the battery than allowed by having it plugged-in (the car does some strange things with the battery pack to protect its lifespan, essentially leaving a fudge-factor at the charged and discharged end for things like 'a place to put regen energy when the battery shows full' and also 'a place to get reserve passing power when the battery shows empty' I've experienced both extremes in the course of less than 24 hours. Tangent #1 - on the prior day's up-hill drive with a stated 'empty' battery, I did experience what felt like a kick-down to passing gear at one point on the hill. This apparently was the Volt deciding to let me tap into the reserve in the battery. However, the reserve was not enough to get me home before giving a warning message of 'reduced power' and I ended up losing about 10mph in the last 2 miles of the climb. This happened over the course of an 8-mile drive with 1500' elevation gain. Maximum speed ended up in this stress test as 50-55mph. Tangent #2 - On the downhill side, I put the car into L ('mode') to increase the regenerative braking. This did successfully keep the downhill speed under control until it filled the reserve capacity of the battery. So, about 2/3 of the way down the hill, I went from having a feel of 'engine-braking' through the regeneration pulling off speed as electricity into the battery to then feeling like I was coasting (and then need to use the actual brakes to keep speed down). In both cases, you have to understand what the car is doing with energy management to not be caught off-guard by the behavior. I wonder if 'average' Volt buyers are going to understand what is going on - at least the first time. But, I digress, the stated range on electric got as high as 50 miles by the time I got down to the bottom of that same 1500' elevation change and had pulled every bit of extra energy from the drop and stored it into the battery pack's reserve capacity. I topped off the tank (premium fuel required), to have a good baseline, and it took about 1.5 gallons to have the tank full - we'll see after a week how much gas I really burn. As you can see in at the end of my drive to work, I had gone 23.5 miles, using 3.7 kWh or electricity (the Volt battery is 16kWh with a stated 10.4kWh usable). 0.00 gallons of gas used. Range shows 36 miles of electric driving left - which says a lot more about the downhill to-work nature of my specific commute, but it is kind of fun to see 23.5 miles traveled on essentially 3 miles worth of stated electric range. (I reset my trip gauge at the fuel-top-off, which is where the 14.0 miles comes from, if you were wondering). We'll just ignore the pie-in-the-sky figure of 250+ mpg for the trip for now. The rest of the day saw a trip across town in Boulder, a drive up and through Longmont, then back to up the hill for the 1500 ft elevation gain to home. I was able to make all but the last 7.4 miles of today's driving on electric. As you can see in the attached end of day energy use stats, I managed 52.5 miles of electric driving (not bad for a car that is rated at 35 miles of electric range - even if you figure the first 10 miles were essentially free as they were all down-hill). 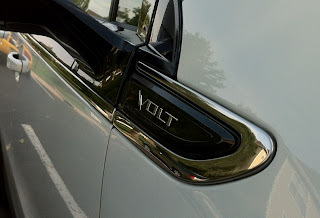 I didn't use the Volt's 'mountain mode' to prepare for the climb. Mountain mode attempts to keep 40% charge in the battery. It will run the range extender at high-speed to charge the battery to this level if you are below, or do nothing at all if you are already at that charge level. This is to preserve some capacity for hill-climbing and would have been a good choice. I ran out of juice only a couple miles right before the climbing beings in earnest and this time did not run into the dreaded 'reduced power' mode. However, this is largely due to keeping my speeds down to the 55mph that I was limited to in the reduced power mode the night before. Even so, the gas engine was revving quite high to generate all the power it could to keep things moving along (the generator is capable of 74hp - which is only slightly less than half the 150hp the electric drive motors can consume, which is why hill-climbing in this mode is not slower than if you have a charged battery. Tomorrow will not have the extra errands thrown in, so I might be able to make the full drive on battery power - we'll see. That said, you can see that I burned 0.4 gallons of premium gas (@ 3.699/gallon) and used an even 10.0kWh of electricity. @ 8.7-ish cents per kWh for me, that means a total cost of driving today of $2.35. Figuring the same drive in my comparably sized sedan @ 25mpg, I would have burned $8.85 of gas.